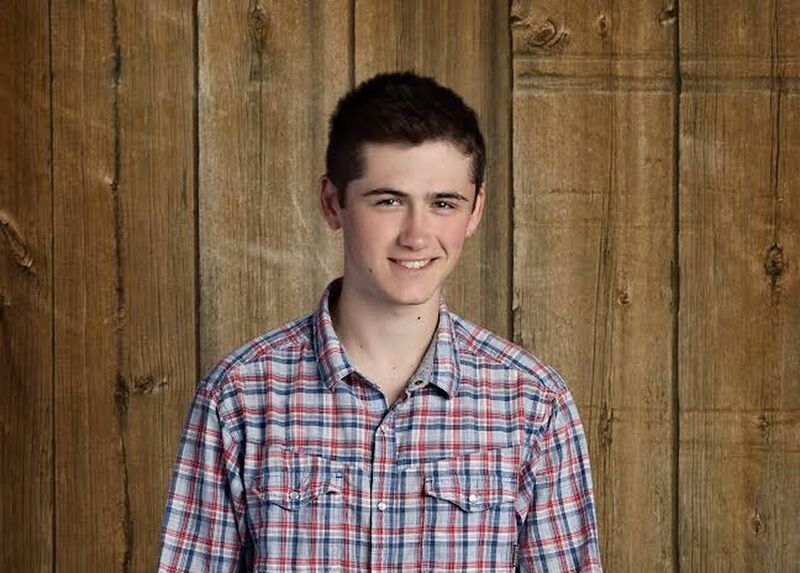 PALMER — Court documents shed grim new light on the final moments of the life of David Grunwald, a 16-year-old from Palmer whose mysterious disappearance in mid-November sparked major search efforts in the Valley and drew national attention. Alaska State Troopers say a teen guided them to Grunwald's body in the trees about 200 feet off Knik River Road on Friday afternoon. Now the charges against Erick Almandinger, the 16-year-old charged as an adult with murder in Grunwald's death, say that Grunwald was pistol-whipped in a camper before he was killed. Almandinger said he watched as a friend beat Grunwald, according to the charges. Then, Almandinger told an investigator, at least two of them drove Grunwald to the Knik River. Another teen shot him once in the head, according to a sworn affidavit filed Saturday by trooper Sgt. Tony Wegrzyn in Palmer Superior Court as part of the charges. 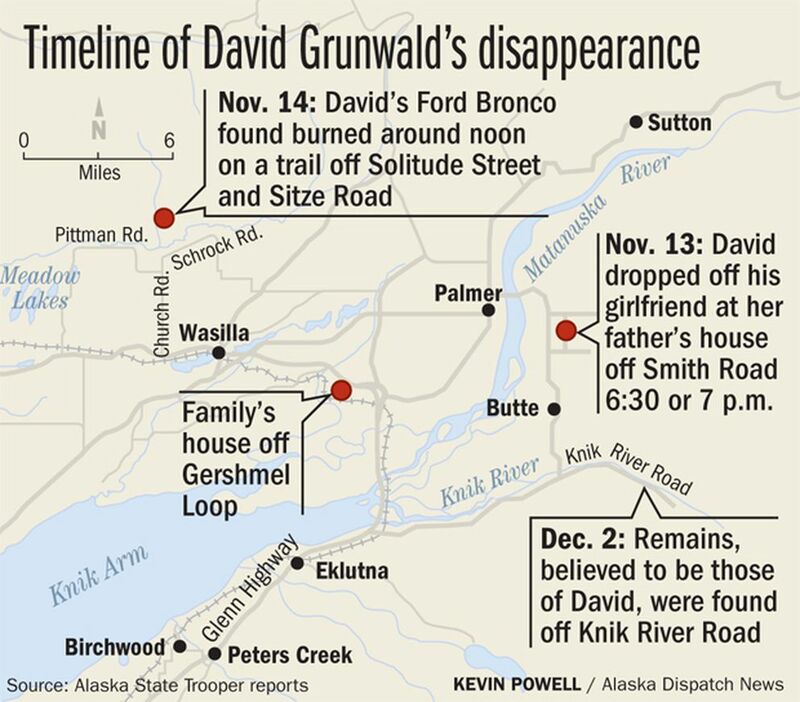 Grunwald went missing Nov. 13 after dropping off his girlfriend at her house. His torched Ford Bronco was found more than 20 miles away around noon the next day. Relatives, friends and concerned strangers mounted a desperate search, with few initial leads, for a teen described as punctual and responsible. Almandinger is the only person charged in the killing as of Monday. Now that the charges have been filed, prosecutors have 10 days from Almandinger's arraignment Saturday to get the case before a grand jury, according to Palmer District Attorney Roman Kalytiak. The grand jury has the discretion to charge others, Kalytiak said. Grunwald's parents, Ben and Edie, said in an email Sunday night that the news of their son's death was "devastating" as they struggled to comprehend the phone call that represented their worst-case scenario on Friday. They asked for privacy but expressed gratitude for the support from the community and the work of the troopers. "The kidnapping and murder of our son was unnecessary, weak minded, cowardice and shameful," the couple wrote in the email. "David was a sweet, caring and respecting boy. He was viciously attacked and murdered." Grunwald was in his first year at Mat-Su Career and Tech High School after moving there from Colony High School. He was focusing on engineering and aviation. The mood at the school Monday was noticeably different and somber but staff was also making a point to hold to routine, said principal Mark Okeson. Counseling staff was available for students who wanted to talk. They were assembling a remembrance book for Grunwald's family. Teachers had been instructed to discuss Grunwald's death as much or as little as students wanted, Okeson said. "It's sort of something you sense in the faces of some students," he said. "I just talked to one student, a friend of David's. He's got a heavy look about him." The investigator's affidavit provides the first public account of the hours leading up to Grunwald's death. Almandinger said Grunwald came to his house on Esty Drive in Palmer on Nov. 13 "to drink and smoke" in a camper trailer in the yard, according to the affidavit. At one point, Almandinger left the trailer and went into the house. He said a friend identified only as "D.J." in the charging document messaged him and asked him to bring a gun back to the trailer, according to the affidavit. "Almandinger said he brought a .40 caliber semi-automatic handgun to the trailer and handed it to D.J., at which time D.J. bludgeoned D.G. with the pistol," Wegrzyn wrote. Almandinger said the other teen loaded Grunwald into the Bronco and they drove to Butte, according to the affidavit. On the way, Grunwald was going in and out of consciousness and unable to defend himself, the affidavit said; he asked to be taken to his girlfriend's house in Butte, but they passed her road and kept going another 10 minutes or so to Knik River Road. They pulled over and walked into the woods with Grunwald, according to the document. "Almandinger admitted he went with D.J. as they escorted D.G. into the woods and acknowledged that D.G. was pleading for his life as they walked," the investigator wrote. Almandinger said D.J. killed Grunwald, according to the affidavit. He later changed his story and identified the shooter as another 16-year-old identified in charging documents only as "A.B." Almandinger said he decided to destroy the evidence, so the pair got some gasoline and drove the Bronco to a trail up Bald Mountain Ridge, off Sitze Road, and burned it, the affidavit says. They tried to destroy the bloody evidence in the camper by burning a carpet and applying bleach, according to the document. Almandinger said he then stayed in a friend's shed for several days. Wegrzyn wrote that he contacted D.J. on Friday and was given directions to where Grunwald was killed after the teen consulted with an attorney. Another investigator found a single 9mm shell casing nearby. Almandinger showed little remorse during the interrogation, Wegrzyn said. The only motive cited by Almandinger was that Grunwald "had smoked all his weed," the sergeant wrote. "He said they didn't get any money." Almandinger was charged with first-degree murder and kidnapping Saturday. People at the house in Palmer where he lived declined to be interviewed Monday. Along with details of the crime, the affidavit also revealed the deliberate pace of an investigation that to anxious outsiders, including Grunwald's parents, at times appeared painfully slow. Almandinger was a person of interest immediately, the document shows. Grunwald's girlfriend told Grunwald's parents that he might be taking Almandinger to Anchorage that night. Ben and Edith Grunwald said in an interview last week they called Almandinger's father but got few answers except that Almandinger, too, was missing that night. Troopers started going to Almandinger's house the day the Bronco turned up near Schrock Road but didn't find him at home until Nov. 16, according to the affidavit. At that point, he told a "vague" story about getting a cab to Anchorage instead of going with Grunwald, Wegrzyn wrote. The investigator called the cab company and learned they didn't give any teens a ride to the city on the night of Nov. 13, the document says. After getting a search warrant for Almandinger's Samsung tablet, investigators tracked a "ping" from it to a location near where the Bronco was found, "during the timeframe when investigators believed it was burned," Wegrzyn wrote. Then on Nov. 22, another investigator — poring over surveillance video from a gas station near where the Bronco was found — spotted a cab going north and then south a short time later on the night Grunwald went missing. The trooper interviewed the cab driver that same day, who said he picked up three juvenile males "not dressed for the weather" on Schrock Road at the Little Susitna bridge, according to the document. They asked to go to Almandinger's address, but didn't have enough money so he dropped them off near Palmer. Wegrzyn wrote that the camper was impounded after getting a search warrant Nov. 29 for Almandinger's house. Inside investigators found "an overwhelming odor of bleach" and blood on the floor, walls and toilet. On Friday, after D.J. led investigators to Grunwald's body, Wegrzyn brought Almandinger, together with his father and grandmother, to the troopers' Palmer post for an interview. Initially Almandinger claimed to know nothing about Grunwald's death but when "confronted," he told investigators his version of the events leading up to the shooting on the Knik, Wegrzyn wrote. "Almandinger showed very little if any remorse for his actions and only shed tears when advised his 'friends' had talked to the police," he wrote.